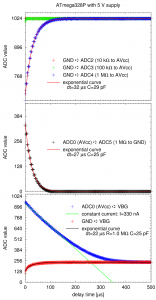 where I investigated the possibility of the Atmel ATmega series microcontrollers to select the internal bandgap voltage VBG as input for the analog-to-digital converter. 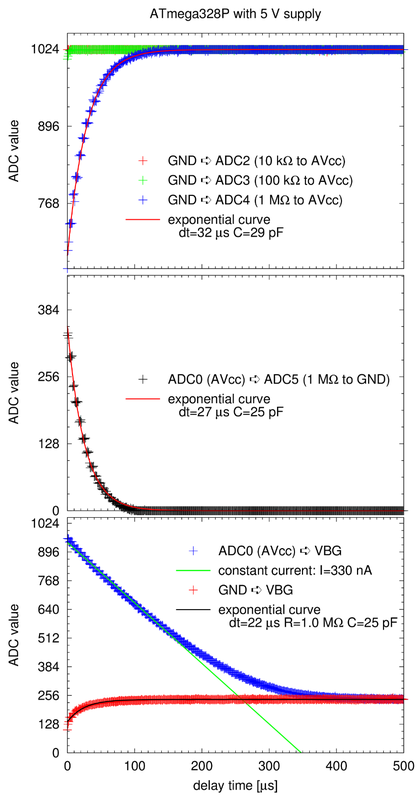 Using the analog supply voltage AVcc as reference for the conversion this allows you to measure the chip’s supply voltage without using any pin or any external devices. However, when implementing this feature into a project prototype I observed a strange behavior. The datasheet and the big internet were not very helpful in this respect, recommending among other things to discard the first conversion result, but this did not result in concise results either. A simple yet versatile testcircuit for the analod-to-digital converter. 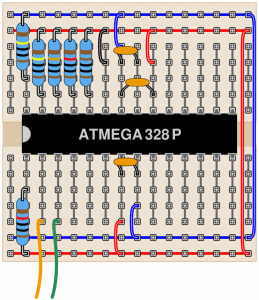 A sketch of the test circuit on a breadboard. 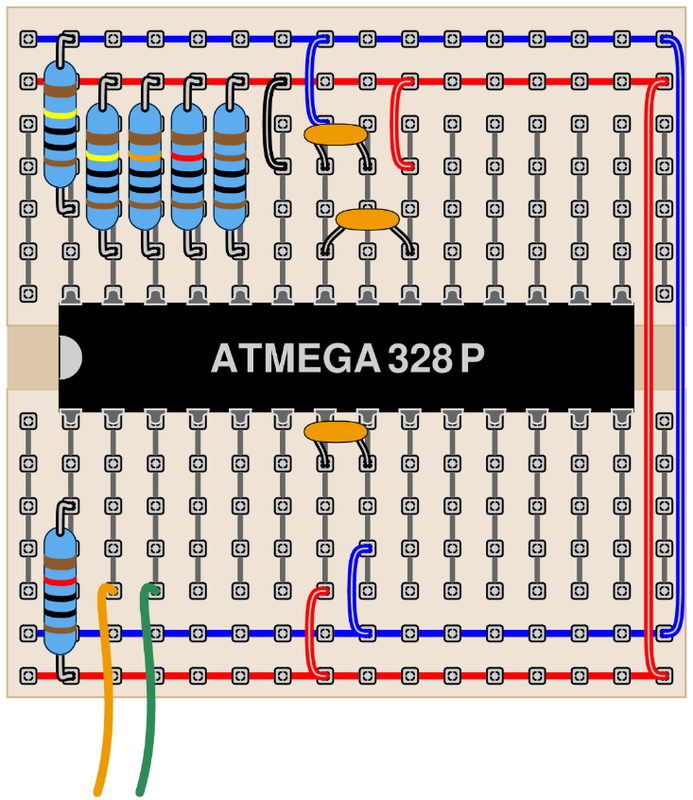 By charging the sample-and-hold capacitor from one channel of the input multiplexer and then switching to another channel it is possible to extract the dynamic properties of the analog-to-digital converter section inside the ATmega. As can be seen from the graphs below, the sample-and-hold capacitor inside the ATmega328P appears to be about and thus larger than the value of from the datasheet. 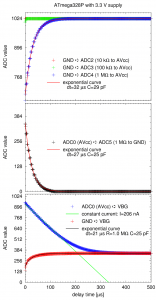 The datasheet recommends a source impedance of or below – interestingly, the designers at Atmel themselves did not follow this recommendation when they designed the connection of the VBG source to the input multiplexer. The impedance for this connection appears to be in the order of but apart from this the connection is asymmetric with a source which can rather source than sink a current. 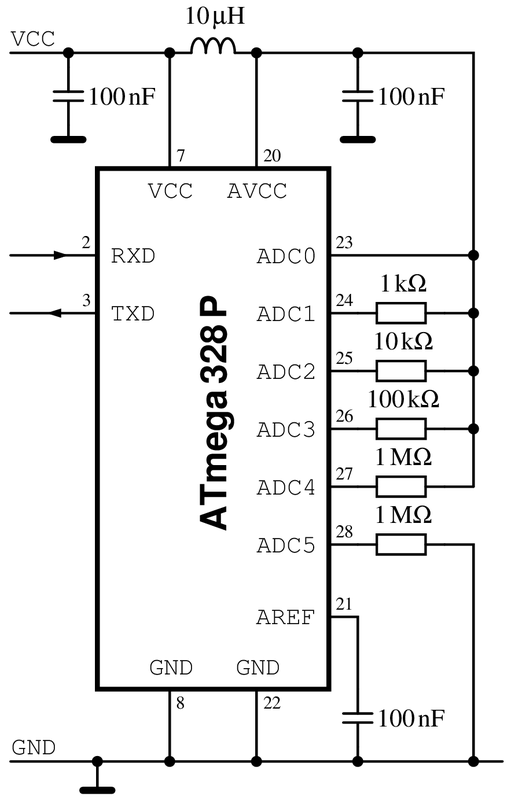 Timing of the internal analog-to-digital converter of an ATmega328P with a 3.3 V supply voltage. 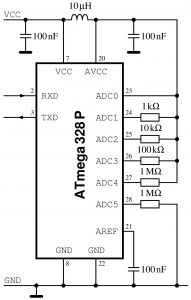 Timing of the internal analog-to-digital converter of an ATmega328P with a 5 V supply voltage. The above data was collected using a quartz crystal and an assembler loop for the timing delay in steps of . 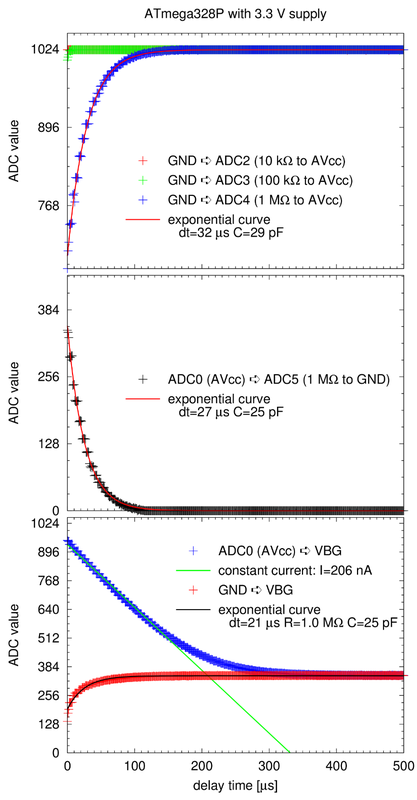 The charging of the sample-and-hold capacitor before switching channels was done for from a low-resistance conenction to either AVcc (external, ADC0) or GND (internal). The ATmega328P has a datecode of “1312”.